Carmen and I dined at the No “Q” No Taquería, another taco shop roughly local to our neighborhood. They have an extensive and largely handmade menu spread across the wall. You can eat at one of several tables inside, where a loud jukebox keeps spirits lively, or outside in front of the parking lot on Venice Boulevard, another of Los Angeles’s great taco environments with the feel of a semi-enclosed outdoor space. Tacos are $1.00 each, the cheapest tacos I have encountered this year, and they varied from average to well above average in size. It would really be more appropriate to charge $1.25 for tacos like these. I automatically chose one each of al pastor, carnitas, and carne asada. Despite the low prices, they serve you at your table after you order up front. First the serveuse brought us a big gratis bowl of chips and fresh red salsa; then our tacos, with an admixture in a bowl of cilantro and diced onion for our own application. The combination of nice service and a bill of less than $8 for two eaters makes you want to leave a tip. After assembling tacos, I started in on the carne asada. It was very juicy, leaking a brown, meaty liquid out the back of the taco, and very flavorful, bringing back a strong sense of recognition of spiced beef that I couldn’t immediately place; later I decided that it tasted of carne asada seasoning, and figured that perhaps the familiarity it evoked came from a resemblance to the seasoned ground beef one makes at home on taco night. This description will surely make the taco sound unsophisticated to the reader, but I assure you it was tasty, and I recommend it to you as long as you are not a snob. 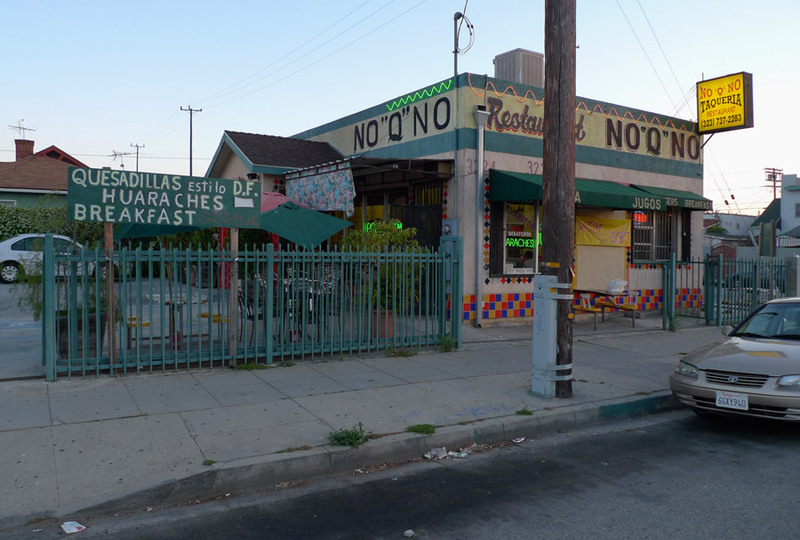 But then a snob probably wouldn’t go to a place that looks like the No “Q” No Taquería anyways. I could gobble up quite a few of these tacos. Second was the al pastor taco. It was the biggest – look at the picture and appreciate the heap of meat I received for my dollar. The al pastor was saucy and quite sweet, with good-sized and super tender chunks of pork. Lastly I ate the carnitas. 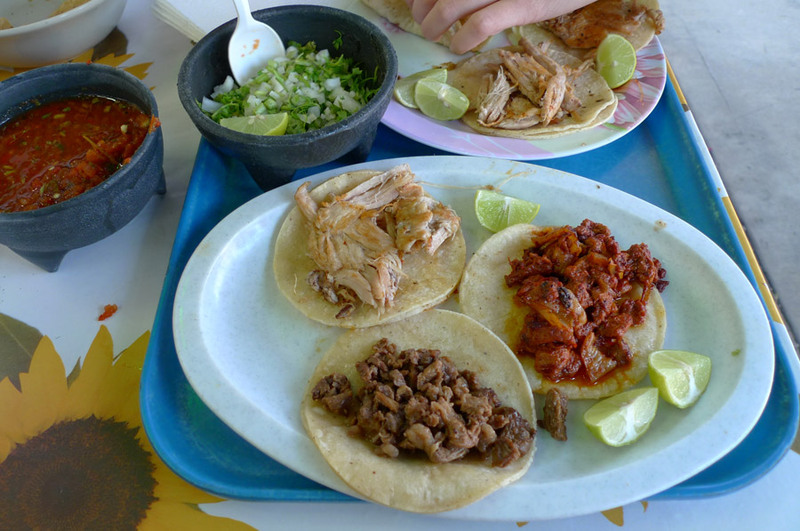 Their unusual carnitas is the pale chicken-looking taco you see in the photo. Carmen speculates that their process is to grill a pork chop, shred it, and then sauté the shreddy bits. I’ve never seen anything called “carnitas” like this before, but it was good – tender, and unmistakably porcine in flavor. Tortillas were the normal kind; they were not bilaminated, so that I was able to take advantage of the tortilla offset method. The first two tacos had tortillas a bit clammy, but they did not fail; the third taco had nicely leathery tortillas, perhaps owing to the drier filling, but it seemed like they had been grilled longer. After enjoying another fine taco meal, I reflected upon the fact that the cincuenta taquerías project keeps on yielding dividends – tacos are better than the stock market. Seven more months of rigorous taco-eating are spread across the horizon.